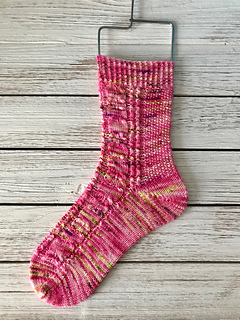 The Cloudburst Socks are a delicate cabled sock pattern that was inspired by the weeks of never-ending rain that Kentucky seems to have been experiencing recently. Every time I turned around the clouds seemed to be opening up with rain and thunder storms. The weather has made for a beautiful green Spring and Summer with beautiful growth and thankful horses. 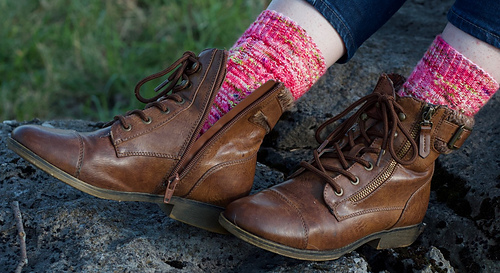 The Cloudburst Socks are great paired with a lightly speckled, lightly variegated sock, tonal, or solid sock yarn. Women’s Small: 6.5-10 inches around. Women’s Medium: 7-11.5 inches around. Women’s Large/Men’s Medium: 7.5-13 inches around. These socks were written for the magic loop technique with a 32 inch circular needle, but can be converted to double point needles (DPNs), or two circular needles. The socks shown above are in the small size and made for a US size 6 foot.